Digital games are here to stay. People spent more on digital console games over the holiday season than ever before, jumping 10% on PS4 and Xbox One. The sales across platforms are staggering and ever increasing, but all platforms are not created equal. According to the guys at SuperData, while platforms are selling more digital games than ever, they’re also offering more discounted games leading to a lower average transaction cost. Aggressive sales of digital games on consoles allowed the category to grow 10 percent compared to December a year earlier. Totaling $110 million in sales, digital unit sales on both the PS4 and XOne jumped as the year came to a close. Compared to November, both platforms sold on average 12 times more units (full game downloads), but obviously did so at a lower than usual price-per-unit. 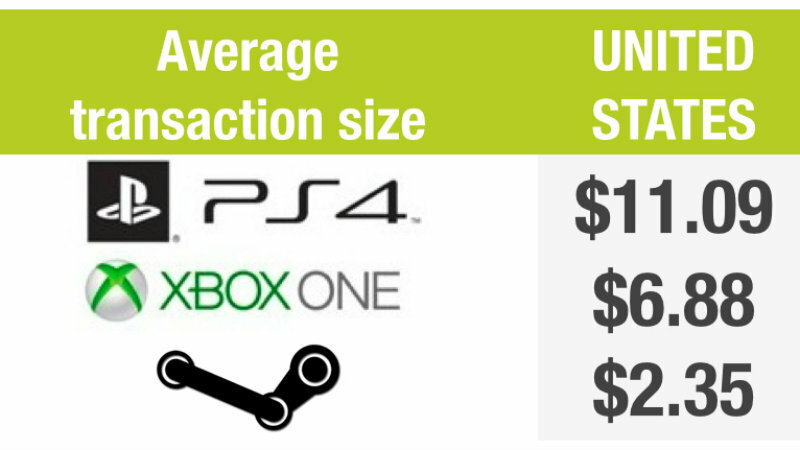 The monthly average transaction value on PS4 dropped from $20 to $11, and from $21 to $7 on the XOne. By comparison, the average transaction value on Steam dropped to $2, down from $8 in November, as a result of this year’s Winter Sale. Obviously the Steam Holiday sale greatly skews these numbers. Most games are discounted to ridiculous prices – you can pick up some incredible titles for as little as $1. It’s no wonder the average transaction value dropped to $2. I’m just surprised by the different between the consoles. Games are generally priced the same, although Xbox One did have some incredible sales over the holiday period, such as Far Cry 4 for an absolute steal. I know how much I spend on average at retail – I only really buy games if I can get a deluxe or collector’s edition so it often ends up being a lot of money. However, I still pick up the odd game on Steam or via the PSN. I wonder if I’m bringing those statistics up or down.